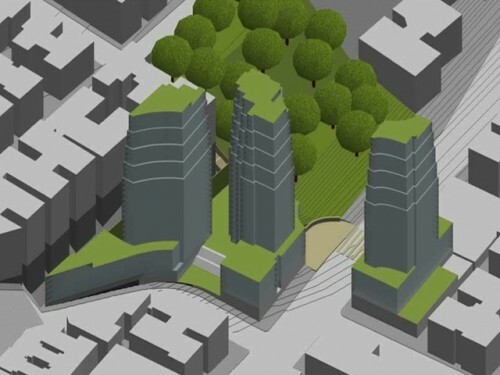 After falling a bit off the radar, the folks from Quadriad Reality are back in Washington Heights with a revised plan to build a cluster of towers just down the hill from The Cloisters, DNAinfo reports. The 34-story towers will be an anomaly in a neighborhood where the the average apartment block runs from about ten to twelve stories. Just up Broadway, Peter Gluck is planning to build a modular building, Steven Holl’s Campbell Sports Center is taking shape, and Field Operations’ contentious park has broken ground.